MICROBE-LIFT/PL Gel is a technological breakthrough because it's the first product that puts the bacteria right where you want it and it stays there! 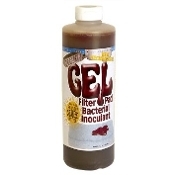 MICROBE-LIFT/PL Gel will quickly attach to and populate any filter media including foam, strapping, floss, bio-balls, spring flo, ceramic media, etc. This will help to rapidly establish the necessary biological activity in your filter to stabilize your pond's environment quickly. It will also help restore this activity to your filter when you clean or change the media in your filter.